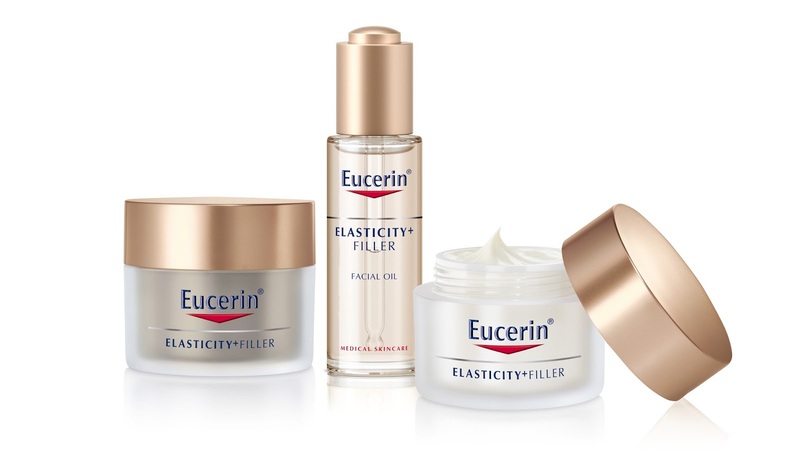 Ladies and gents, I am back with an update on the Eucerin Hyaluron Filler + Elasticity range! Recently I shared that I received the entire range and would be trying them out for review. If you want to find out more about these products and what they’re meant to do, check out my last post. 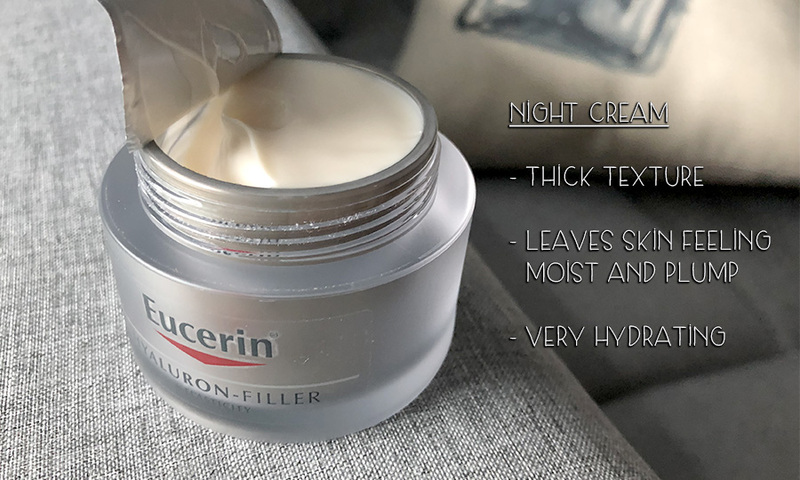 I’ve never tried Eucerin products before – all I know is both my sister and husband were (separately, on different occasions by different tattoo artists) recommended Eucerin body lotions after they got their tattoos, because it would help to reduce flaking and dry skin so the tattoos would come out nicer. So needless to say, I had a good opinion of the brand, but never had a chance to use their facial range. 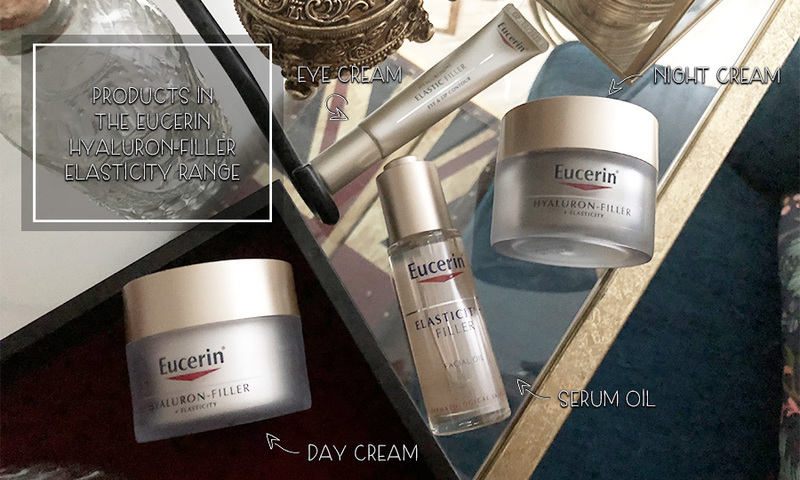 The Hyaluron Filler + Elasticity range is neatly bundled into 4 products, an eye cream, a serum oil (my favourite product by far), a day cream with SPF, and a night cream. All the products feel very rich and moisturising, but not oily or heavy. Products absorb into the skin beautifully, even the oil. Bear in mind this is an anti-aging range, so it’s a lot more emollient than your regular moisturiser and therefore might be a little too heavy for the oily, acne-prone skin that younger people living in tropical climates tend to have. 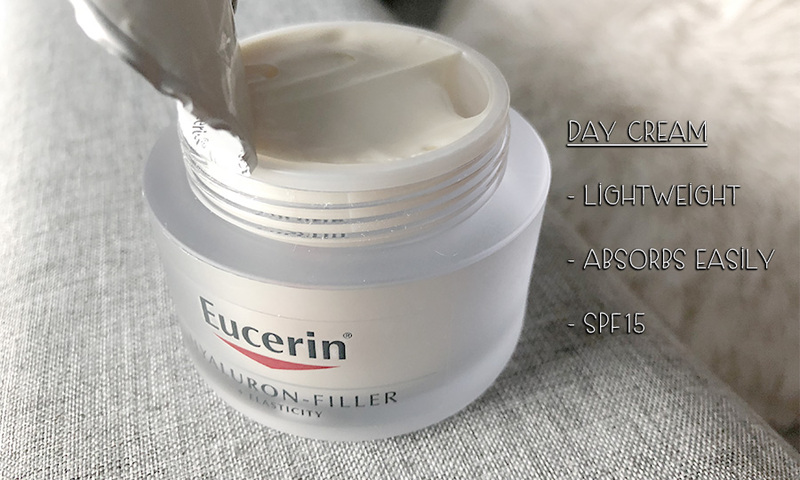 I’m a huge fan of the SPF in the day cream, not because it replaces my sunscreen, but because I feel like even at home especially in a house with a lot of windows you’ve got to have a bit of sun protection, so this covers me for lazy mornings lounging about the house and I love how convenient it is. The serum oil is also fantastic because oils are skin-saviours, whether or not you’ve got oily skin. This one feels very lightweight and doesn’t leave your skin feeling greasy. Add it into the moisturiser and you get a beautiful, very emollient texture, which is great for facial massages. I’ll share a quick facial massage in my next post which is great for draining lymph nodes, slimming your face, and keeping your facial muscles from sagging. Although the products are packaged in plastic, they still feel very luxurious, with matte champagne gold lids and a clean, sophisticated design. The moisturisers come sealed, so you know they’re brand new and ‘fresh’. They’re relatively travel-friendly too – I took them to India with me on holiday and they didn’t leak or break, despite my luggage being handled pretty roughly during multiple transit flights. Here’s where it starts getting interesting. I’ll discuss performance of the range as a whole, since that’s how I experienced it. Fine lines underneath eyes – these didn’t go away, though they so seem less pronounced. I like that the eye cream helps my undereye concealer sit a little bit better and crease less, so it’s still a sort-of win for me. Hooded eyelids – not much change here. 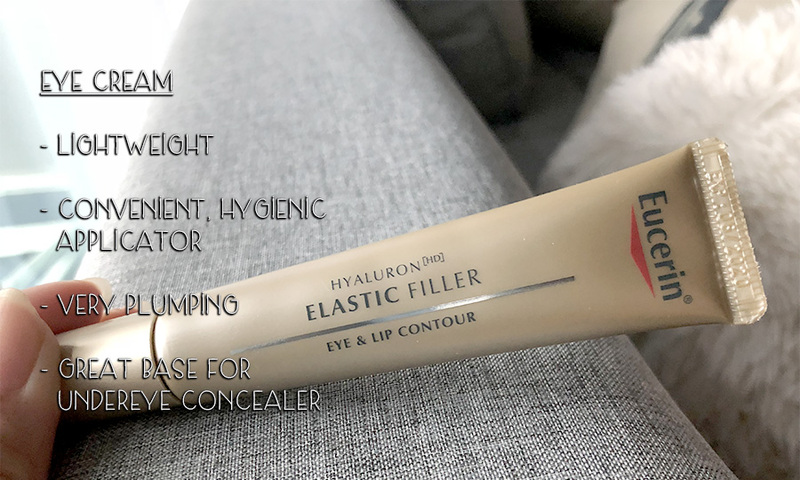 Undereye bags – I’ve definitely seen a big improvement here – I’m pretty sure it’s the combination of this cream plus my finally catching up on sleep that I lost whilst on vacation. Smile lines – I think I do see a slight improvement here – they weren’t very prominent to begin with but I feel like my skin texture in this area looks a little better in photos now. Sagging mouth corners – these are a big issue for me. I really don’t like how this particular feature ages my face, so I was definitely looking out for changes here. It might be a little too soon for a big change, but I can already feel a change in the texture of my skin. I find this really promising, because the range is, after all, specifically formulated to target sagging skin as an alternative to fillers. So stay tuned to my Instastories to find out if this continues to improve over the course of the next few weeks! Skin texture on neck – this is where the products showed the most difference. Before I started the trial, my skin was dry, and had a soft, almost crepe-y texture? (Eww, I know.) But after these past 2 weeks, my skin is already feeling firmer and fuller. So far, this range is on the right track, as far as I am concerned. I am pretty impressed, considering this is a drugstore brand, and that the products are quite affordable in comparison to other anti-aging products out there on the market! As I mentioned above, I will be posting a facial massage technique video, and will update you then if there are any further changes in my skin. 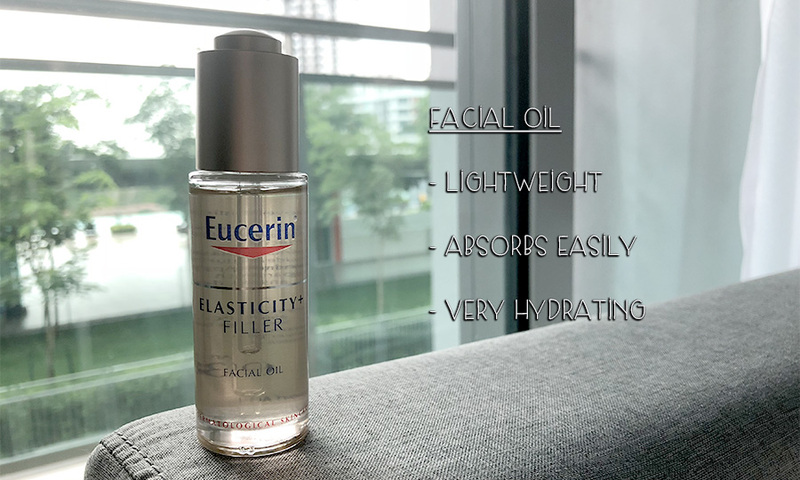 If you want to learn more about your own skin, don’t forget to head over to a Guardian outlet in Suria KLCC or Mid Valley Megamall this month to test it at one of the ‘Eucerin Face-Age Test’ Mirrors. This innovative test evaluates skin elasticity, firmness and overall radiance of the face to determine the age of your facial skin! , and you can follow me on Instagram and my Facebook page for more updates!